The software is used to find airport links, Bluetooth devices and bonjour services. The software can be downloaded from the website istumbler98 and it costs around five dollars to download. The software is constantly being updated and hence the website offers one a link for you to have updates that notify you about the upgrades of the software to describe the software in full I would say it is one of the best wireless discovery tools for Mac os x giving tools for finding airport networks and Bluetooth devices and bonjour services with your laptop especially your Mac laptop. 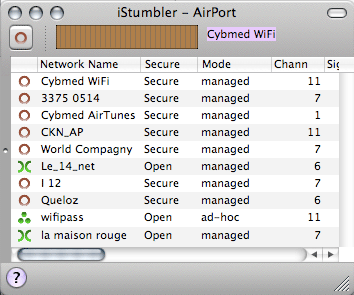 The new or upgraded version of the istumber has, rewritten airport plugin that can correctly signal for all airport chips and it provides information about all networks. The information window that it had has now been resized. The theoretical maximum percentage is how that noise and signal are reported. The dBm values are shown by the airport inspector when they are available. The airport and Bluetooth radio information is cleared out by the empty command cache and the spectrum widget is now a universal binary. The product can run as long as one has Mac OS X 10,4 Intel and Mac OSS X10,4PPC AND Mac 10,3,9. The new version of the product is great as it offers full band width unlike the previous, istumber active which only offered around 400kbytes/sec. the only adverse development with the new product is that it is missing features of GPS and the mismac does not work with some of the operating systems that people have in their homes. Download the iStumbler application from here. Chetan you have so much info in Mac OS, tell me are you using MAC? Of course he is using MAC..
Didnt you know this before? ?